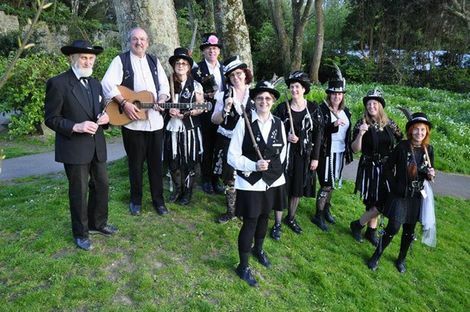 Welcome to the web site of Pensans Morris — we are a bunch of entertainers bordering on morris in West Cornwall, UK! The side started dancing in early 2010 and does not take itself too seriously. October through April we practice on Thursdays (at Penlee Coach House) from 7:30pm and afterwards we have a music and song session at the Yacht Inn (music, song, stories, poetry, other types of dancing, you name it and we probably do it) — why not meet us there ? If you would like to join us (no dancing experience is required - we have all levels here) we would welcome you (musicians too, doesn't matter what instruments you play). The key word is FUN ! We are affiliated to The Morris Federation — What is Border Morris?